Beach volleyball in town square, team tutti frutti, game and canoe lane. 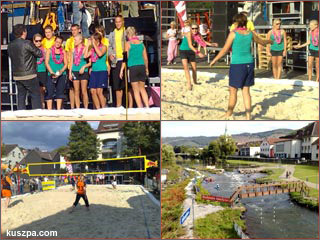 There is a small beach volleyball tournament taking place in Hagen-Hohenlimburg today and tomorrow. It’s more like an village fair, but it’s fun. My favourite team was called „tutti frutti“. Unfortunately they had to play against a quite good team called „Die Männer von Flaake“ and lost 15:21. But I am sure, they will go for the first place next year, if you consider the grand prize; 100 tins of beer! hello, my surname is the same one that you. It is strange knowing that „kuszpa“ is not really a very common name! I’m 26 years old, I’m webdesigner in Paris.